Trainer and jockey Johnny Murtagh said it was the best day of his life after produced Royal Diamond with a late run to win the Qipco Long Distance Cup by a nose. Murtagh has farmed many of the big races this campaign but Royal Diamond, whom he also trains, was sent off at 20-1 after running a lifeless race in the Irish St Leger, which he had won the year before. Harris Tweed appeared to have fought off all his rivals with a brave bid from the front, but Murtagh made up late ground to pounce by a nose right on the line, with another three-quarters of a length to Eye Of The Storm in third. The Queen's filly Estimate held every chance in the straight but never looked like adding to her Gold Cup gains from the Royal meeting. An emotional Murtagh said: "This is the best day of my life. I can't thank everyone enough for giving me the horse and trusting me with him. He's been a brilliant horse from day one. I'm privileged to ride so many great horses, but it's all about my staff and my team. He's all heart, this horse." Winning owner Andrew Tinkler said of the evergreen Murtagh: "I think what makes him so good is that he's a workaholic and he gets into the horses' heads. He understands them, he rides them every morning and his confidence fetches him through. "In horse racing this is the best day of my life. We had Dubawi Gold second in two Guineas but to win the first race at Champions Day with a horse we didn't think was going to be anything, well nothing can top that. "We decided against the Melbourne Cup and brought him here and won - you can't beat that." Trainer William Haggas was delighted with the performance of stable favourite Harris Tweed despite being caught by a nose on the line. “I couldn’t have more been proud of him if he had won,” said Haggas. “He ran his guts out and I am proud as punch. He was beautifully-ridden and I’m just sorry for him that he was beaten but it was a career-best performance. Pat Smullen believes Pale Mimosa is capable of making her mark in the Cup races next season after turning in an excellent effort in defeat. Deputising for sidelined stable companion and last year's winner Rite Of Passage, Dermot Weld's filly was an outsider for the two-mile contest having failed to run up to expectations in the Irish St Leger last month. However, she bounced back to form to be beaten less than two lengths in fourth place and Smullen believes the result would have been even better had conditions not been so testing. 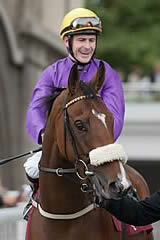 Smullen said: "She ran a very good race. The very soft ground just blunted her turn of foot, but for that she'd have been on top of the first two I think. 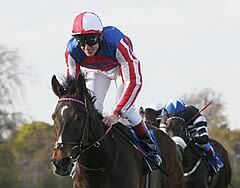 "It was nice to see her put that disappointing run at the Curragh behind her, that was encouraging. "I'd imagine she'll stay in training next year and hopefully she'll make up into a nice Cup horse."